Junior mailroom manager Jenna O’Rourke. The mailroom engages in a variety of tasks such as organizing packages, selling stamps and distributing packages. Everyone stops by the mailroom at some point in their Lawrence career. This week, I want to highlight the crew of student workers who keep the mailroom running. Student managers senior Grace Reif, juniors Jenna O’Rourke, Biju Rajbhandari and sophomore Cassie Smith described their passion for working in the mailroom. 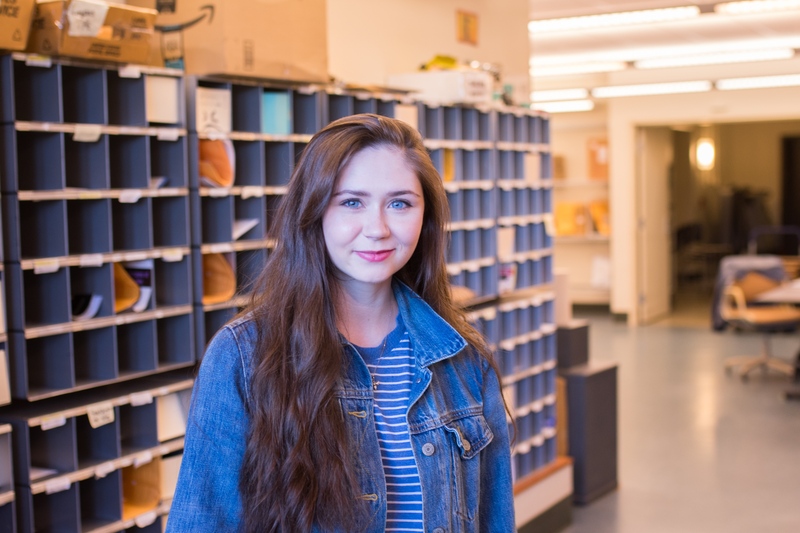 Linguistics and German double major Smith has been working in the mailroom for two years. She applied for the position on her class Facebook page her freshman year. She was trained at the end of last year to become a manager. The mailroom has one freshman employee every year, so she was selected. On average, she works midday shifts three to four days a week. The most valuable skills she has learned on the job are organizational and multi-tasking skills. Smith was a CORE leader and is currently a writing tutor and writer for “Tropos.” For Smith, the most pleasant part of the job is interacting with people and learning how the campus and mail systems work. O’Rourke is an English major. She heard about the job through her sister, who worked in the mailroom when she was at Lawrence. She applied her sophomore year by going to the mailroom window, filling out a notecard with her name, year, ID number and interest working in the mailroom and got the job. Students can now apply on Handshake. In her first year, she was a student mailroom worker. In her second year, she became the manager. Rajbhandari is a psychology and economics double major. Unlike the other student managers interviewed, she was trained to be a manager and did not have to start as a worker. She started working last summer, so it has not been a full year yet. She applied for the position on LUWorks when looking for summer employment on campus. This term, she works two hours on Wednesday and three on Friday. One challenging part of the job is the mail rush from 10 a.m. -1 p.m. when the UPS comes in and packages have to be shelved. It is the longest and most tedious job. Sending packages internationally is also challenging. Additionally, she monitors Briggs Hall. She has learned how to face a variety of problems. She believes anyone interested should apply because so many people are leaving and the job can be stressful but fun when surrounded by good people. Reif is an English major and creative writing minor. She has been working in the mailroom for four years and became a manager a year ago. She makes sure students know what they are doing by answering questions and boosts morale by making sure everyone is having a good time. She was a CORE leader, worked in the garden over the summer and delivered newspapers. Reif does not like following routine, so she likes working in the mailroom because there is always something different. Interacting with students and helping them open their mailboxes is the most challenging task for Reif. Her favorite part of the job is checking in packages because it brings instant gratification. She believes communication and listening are the most important skills to have in the mailroom. Additionally, Reif is one of the captains of the improv team and an Irish dancer competing for the World Championship. She believes that the qualities of a good worker are conscientiousness, a forward-thinking mindset, kindness, openness, approachability, inquisitiveness and knowledge. She works an average of 10-12 hours a week. The student managers would agree that the best part of their job is the work environment and their co-workers. The qualities of someone fit for the job are inquisitiveness, positivity and the ability to take on various tasks. Even when the job becomes stressful, the staff finds ways to have fun and that is what makes the mailroom so unique.